After preparing Chicken Kofta Curry, there were some keemas left over in the fridge which I used for cooking Chicken Keema Uttapam. Those of you, who don't know what uttapam is, allow me to give a short prelude. Uttapam is a thick pancake with toppings of various kinds cooked right into the batter. Its easily distinguishable familiarity with dosa confirms their sharing the same fraternity. But as opposed to the crispier and thinner texture of dosa, uttapam is thicker in breadth, somewhat resembling pizza albeit different in taste. 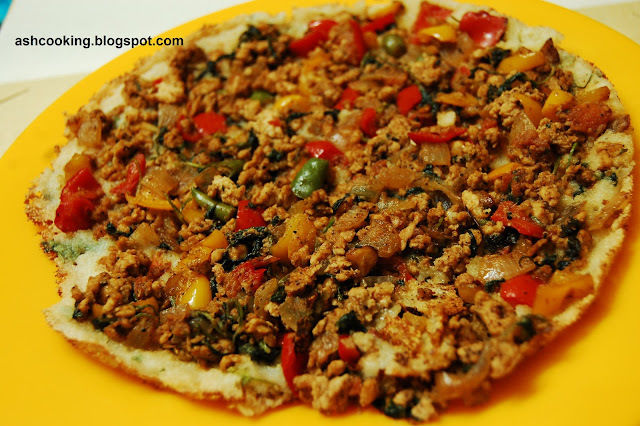 Chicken keema uttapam with its crunchy texture is a great dish to be served to guests or had as snack. The thickness of the topping depends on your liking, but as I like it thick, I have used heavy topping for my uttapam. You may choose to go light on topping if you prefer it that way. To add some extra food values, I have used oats in the batter and that accounts for the unique name of this dish. 1) Heat oil in a skillet. When oil turns smoking hot, add onion and tomato. Fry till onions become translucent. Add bell pepper and minced chicken. Stir to mix in. 2) When chicken is half cooked, add green chillies, salt, chat masala powder, garam masala powder and black pepper powder. Cook till chicken is done. Add water in small measure in case the mixture turns very dry. 3) Now in a mixing bowl, blend semolina, curd, oats, salt and water to a thick batter. Add Eno just before cooking uttapam. Stir well to mix in properly. 4) Heat 1 tbsp of oil on a tawa, non-stick preferably. Spread the batter on it. 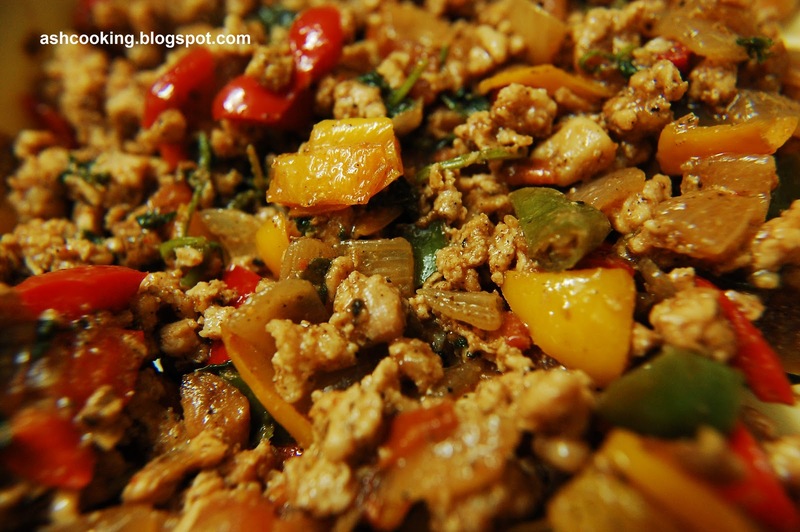 Almost immediately spread the keema mixture on top. 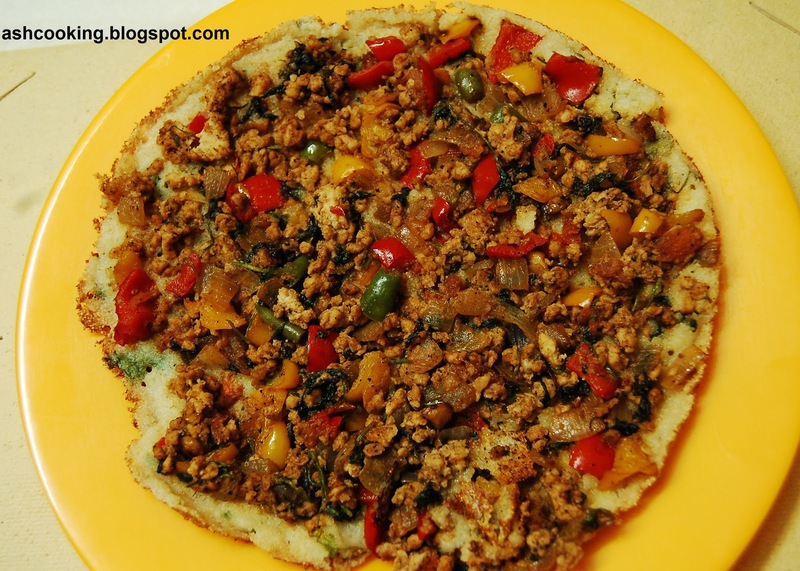 Turn the heat to low and cook till uttapam becomes crispy from the edges and can easily be flipped over. On low heat it usually takes 8-10 minutes for each uttapam to get properly cooked. So be patient. 5) Enjoy the uttapam with a sauce or chutney.